حمیدی زاده, علی, زارعی متین, حسن, ظفری, هادی. (1396). بررسی تأثیر سبک رهبری زهرآگین و رفتارهای کژ کارکردی بر پیامدها و نگرش شغلی کارکنان. مطالعات رفتار سازمانی, 6(3), 1-32. علی حمیدی زاده; حسن زارعی متین; هادی ظفری. "بررسی تأثیر سبک رهبری زهرآگین و رفتارهای کژ کارکردی بر پیامدها و نگرش شغلی کارکنان". مطالعات رفتار سازمانی, 6, 3, 1396, 1-32. حمیدی زاده, علی, زارعی متین, حسن, ظفری, هادی. (1396). 'بررسی تأثیر سبک رهبری زهرآگین و رفتارهای کژ کارکردی بر پیامدها و نگرش شغلی کارکنان', مطالعات رفتار سازمانی, 6(3), pp. 1-32. حمیدی زاده, علی, زارعی متین, حسن, ظفری, هادی. بررسی تأثیر سبک رهبری زهرآگین و رفتارهای کژ کارکردی بر پیامدها و نگرش شغلی کارکنان. مطالعات رفتار سازمانی, 1396; 6(3): 1-32. فقدان رهبری مؤثر، تنها به تشکیلات اقتصادی محدود نمی‌شود، بلکه در تعلیم‌وتربیت، بنیادها و همۀ انواع دیگر ادارات و سازمان­ها به‌چشم می‌خورد. آنچه بعضاً سازمان‌ها را عذاب می‌دهد، وجود کسانی است که نقش برجسته رهبری را در سازمان‌ها برعهده می‌گیرند و نمی‌توانند کار را به‌صورتی مفید و مؤثر انجام دهند؛ رهبران زهرآگین از این نوع افراد هستند. هدف این پژوهش، شناسایی تأثیر این نوع از سبک رهبری و رفتارکژکارکردی این رهبران بر پیامدهای شغلی و نگرش کارکنان سازمان‌های دولتی شهر قم است. روش تحقیق، توصیفیِ پیمایشی و تعداد نمونه آماری 384 نفر بوده و برای جمع‌آوری داده‌ها از ابزار پرسشنامه استفاده شده است. همچنین برای تجزیه‌وتحلیل داده­ها از روش مدل‌سازی معادلات ساختاری و با به‌کارگیری نرم‌افزارSPSS,Warp PLS بوده است. نتایج نشان می‌دهد که رهبری زهرآگین بر رفتارکژکارکردی و تمایل به ترک‌خدمت کارکنان، تأثیر مثبت داشته، اما بر تعهدسازمانی، رضایت‌شغلی و حفظ و نگهداشت کارکنان، تأثیر منفی و معنی‌دار دارد. در فرضیه‌های دیگر، تأثیر رفتارکژکارکردی بر میزان تعهد‌سازمانی کارکنان و رضایت‌شغلی منفی بوده و همچنین رفتارکژکارکردی بر تمایل به ترک‌خدمت، تأثیر مثبت و معنی‌دار دارد، ولی رفتارکژکارکردی بر حفظ و نگهداشت کارکنان، تأثیر معنی‌داری ندارد. بروس ای. شرتزر (1369). بررسی و برنامه‌ریزی زندگی شغلی. ترجمۀ زندی‌پور. تهران. شفیع‌آبادی، عبدالله (1376). راهنمایی و مشاوره شغلی و حرفه‌ای. تهران: انتشارات رشد. فلاورز، وینسنت و هوگز، چارلز (1371). چرا کارکنان سازمان را ترک نمی‌کنند؟. ترجمۀ مصطفی قاضی‌زاده. تهران: نشر مرکز آموزش مدیریت دولتی. Aryee, S., Sun, L., Chen, Z. X. & Debrah, Y. A. (2007). Antecedents and outcomes of abusive supervision: Test of a trickle-down model. Journal of AppliedPsychology, 92, 191-201. Babiak, P. & Hare, R. D. (2006). Snakes In Suits: When PsychopathsGo To Work. Regan Books, Harper Collins Publishers, New York. Bennett, R. J. & Robinson, S. L. (2003). The past, present, and future of workplace deviance research. In J. Greenberg (Ed.). Organizational behavior: The state of the science (2nd ed). Biron, M. & Boon, C. (2013). Performance and turnover intentions: a social exchange perspective. Journal of Managerial Psychology, 28 (5), 511-531. Boddy, C. R., Ladyshewsky, R. K. & Galvin, P. (2010). The influence of corporate psychopaths on corporate social responsibility and organizational commitment to employees. Journal ofBusiness Ethics, 97, 1-19. Brennan, A., Ferris, P., Paquet, S. & Kline, T. (2003). The Use and Abuse of Power in Leadership. University of Calgary. Prepared for the Canadian Forces Leadership Institute. Kingston, Ontario. Brough, P. & Frame, R. (2004). Predicting police job satisfaction and turnover intentions: The role of social support and police organizational variables. New Zealand J Psychol, 33(1), 8-16. Chang, W.A., Wang, Y. & Huang, T. (2013). Work design–related antecedents of turnover intention: A multilevel approach. Human Resource Management, 52 (1), 1–26. Conger, J. (1990). The dark side of leadership. Organizational Dynamics, 19, 44−55. 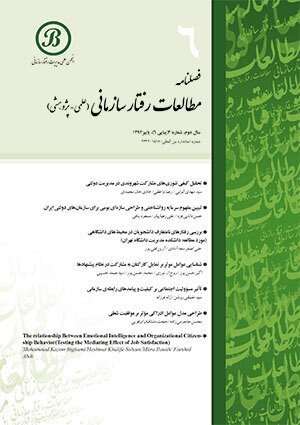 Davoudi, S. M. M. & Fartash, K. (2013). Turnover Intentions: Iranian Employees. Journal of Indian Management, 10 (1), 89-99. Elci, M., Sener, I., Aksoy, S. & Alpkan, L. (2012). The impact of ethical leadership and leadership effectiveness on employees’ turnover intention: The mediating role of work related stress. Procedia Soc Behav Sci, 58, 289-297. Frost, P. J. (2003). Toxic Emotions at Work: How compassionate managers handle pain and conflict. Boston, Harvard Business School Press. Frunham, A. & Taylor, J. (2011). The Dark Side of Behaviour at Work: Understanding and Avoiding Employees Leaving, Thieving and Deceiving. Paul The Toxic Manager, Toowoomba, Queensland, P. Niehus. Flynn, G. (1999). Stop Toxic Managers Before They Stop You. Workforce, August. Ghapanchi, A. H. & Aurum, A. (2010). Antecedents to IT personnel’s intentions to leave: A systematic literature review. Journal of Systems and Software, 84 (2), 238-249. Hu, H. H. (2012). The influence of employee emotional intelligence on coping with supervisorabuse in a banking context. Social Behavior and Personality: An InternationalJournal, 40, 863-874. Kellerman, B. (2004). HBS Working Knowledge. Interview with Senior Editor, Martha Lagace. September 27. Rose, K., Shuck, B., Twyford, D. & Bergman, M. (2015). Skunked: An Integrative Review Exploring the Consequences of the Dysfunctional Leader and Implications for Those Employees Who Work for Them. Human Resource Development Review, 1– 27. Koh, H. C. & Goh, C. T. (1995). "An analysis of the factors affecting the turnover intention of nonmanagerial clerical staff: A Singapore study". The International Journal of Human Resource Management, 6 (1). Lipman-Blumen, J. (2005). The Allure of Toxic Leaders: Why We Follow Destructive Bosses and Corrupt Politicians – and How We Can Survive Them. Oxford University Press. Lussier, R. N. & Achua, C. F. (2004). Leadership: Theory, Application, Skill Development. 2 nd Edition, Thomson South-Western. Whicker, M. L. (1996(. Toxic Leaders: when organizations go bad. Westport, Conn: Quorum Books, 11. Walton, M. (2007). Leadership Toxicity— An Inevitable Affliction of Organisations?. Organisations & People, 14 (1). Mulki, JP., Jaramillo, F. & Locander, W. B. (2008). Effect of ethical climate on turnover intention: linking attitudinal and stress theory. J Bus Ethics, 78 (4), 559-574. Neubert, MJ. & Halbesleben, K. (2015). to Comitmentcom A examination of relationships between spiritual, f action calling job satisfaction and, organizational commitment . Journal of ness. Ethics, 132 (4), 859-872. Nielsen, R. P. (2003). "Corruption Networks and Implications for Ethical Corruption Reform". Journal of Business Ethics, 42 (2), 125-149. Padilla, A., Hogan, R. & Kaiser, R. B. (2007). The toxic triangle: destructive leaders, susceptible followers, and conductive environments. The Leadership Quarterly, 18, 176-194. Reed, G. E. (2008). “Toxic Leadership”. Military Review, July–August, 67–71. Robinson, S. L. & Greenberg, J. (1998). Employees behaving badly: Dimensions, determinants, and dilemmas in the study of workplace deviance. In C. L. Cooper & D. M. Rousseau (Eds. ), Trends in organizational behavior (Vol. 5, 1–30). New York: John Wiley. Robinson, S. & Bennett, R. (1995). A typology of deviant workplace behaviors: A multidimensional scaling study. Academy of Management Journal, 38, 555–572. Schmidt, A. A. (2008). Development and Validation of the Toxic Leadership Scale. Thesis submitted to the Faculty of the Graduate School of the University of Maryland. College Park, in partial fulfillment of the requirements for the degree of Master of Science. Tepper, B. J. (2000). Consequences of abusive supervision. Academy of Management Journal, 43, 178-190. Tepper, B. J., Duffy, M. K. & Shaw, J. D. (2001). Personality moderators of the relationship between abusive supervision and subordinates’ resistance. Journal of Applied Psychology, 86, 974-983. Tepper, B. J., Duffy, M. K., Henle, C. A. & Lambert, L. S. (2006). Procedural injustice, victim precipitation, and abusive supervision. Personnel Psychology, 59, 101-123. Tepper, B. J., Moss, S. E. & Duffy, M. K. (2011). Predictors of abusive supervision: Supervisor perceptions of deep-level dissimilarity, relationship conflict, and subordinate performance. Academy of Management Journal, 54, 279-294. Tett, R.P. & Meyer, J.P. (1993). Job satisfaction, organizational commitment, turnover intention, and turnover. Personnel Psychology, Inc.
Vardi, Y. & Weitz, E. (2004). Misbehavior in organizations: Theory, research, andmanagement. Mahwah, NJ: Lawrence Erlbaum. Wilson-Starks, K. Y. (2003). Toxic leadership. Transleadership, Inc.
Xu, E., Huang, X., Lam, C. K. & Miao, Q. (2012). Abusive supervision and work behaviors. Zand, D. E. (1997). The Leadership Triad: Knowledge, Trust, and Power. Oxford University Press.